“The only intervention needed in the Northern Territory is an intervention in communication” Richard Trudgen, author of Why Warriors Lie Down and Die, responds to the news that the Gillard Government will spend six weeks in talks with Indigenous leaders looking for new ideas to deal with the disadvantage that Aboriginal people in the Northern Territory experience. “The Government needs to turn away from paternalistic programs and deliver real programs that empower the first Australians. Right across the remote areas of Australia Aboriginal people, who speak an ‘original Australian language’ as their home language, are cut off from life saving and life changing information that other Australians receive in excess.” explains Richard. For most of these Aboriginal people, English is still a very foreign language, which means that a visit to or from government authorities, service providers, or a trip to the doctor or hospital is a frightening and confusing experience of powerlessness. For their children, schooling is traumatic, dumbfounding and demeaning; resulting in young people having no hope for themselves in a world they cannot understand. Even in important meetings with government or other statutory bodies, these first Australians are forced to receive information in English. This means they do not understand what is being said and due process cannot occur. They are deliberately locked out of the modern information era, leaving them to fill hospitals, jails, rehabilitation centres and unemployment queues and remain living on the fringe of Australian society, at a massive cost burden to the Australian community. 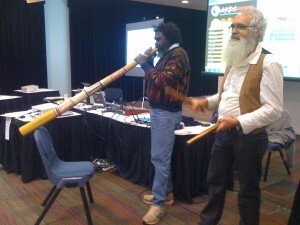 Witiyana Marika and Richard Trudgen play a Manikay (Songline) at Bridging the Gap seminars. These Australians need news, current affairs, general and personal information in a language they can understand. Let’s level the playing field. They could receive information through language centres and radio services. Whole communities could learn to speak English through ‘learn English’ radio programs. Information programs in their language will close the gap permanently. This is one of the issues that Richard Trudgen, Witiyana Marika and Dianne Gondarra address in their Bridging the Gap seminar series, held in capital cities around Australia. The next seminars will be held in Sydney, Brisbane and Darwin in October and November. See www.whywarriors.com.au to register. Most of mainstream Australia is unaware of the communication problem. In the last two years I have been at a cultural awareness day in East Arnhem and another in the central desert. The East Arnhem one was presented by Yolngu people, perhaps just a sign of bigger communities so they have a small portion of people more comfortable with English to present some information about their culture and country to us as strangers. So far I am only just becoming aware of how different the cultures are and so how big the communication gap is. Certainly the mainstream media don’t understand this communication gap, so are not helpful in promoting awareness of it. Getting the message to them is difficult. I will recommend your book to a doctor who has just gone as locum to Yirrkala. As well there may be a few in Brisbane interested in attending the Bridging the Gap seminar.